"Make (or eat!) a traditional local dish." This is a tricky one, because I don’t live somewhere that has a traditional dish. In fact if you google it you get “Hampshire is famous for sheep lamb, beef and watercress.” Erm ok. Watercress it is then!? Unfortunately I don’t really like watercress, the only thing I’ve ever liked it in was when I added some to pea soup. But that’s boring. So let’s look a bit further afield. 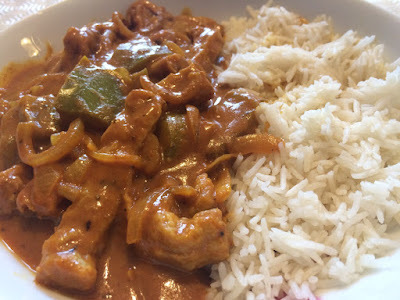 I live in England and on St George’s day, the local pubs quite often serve as their specials of the day, the 2 most popular dishes in England: Fish & Chips and Chicken Tikka Masala. Yep, Chicken Tikka Masala; a dish invented by an Indian restaurant to suit the British palate. Legend has it, it came about when it was improvised in an Indian Restaurant in Scotland, because a Glaswegian bus driver found the regular tikka too dry! I don’t know how true that is, but Imma go with it. 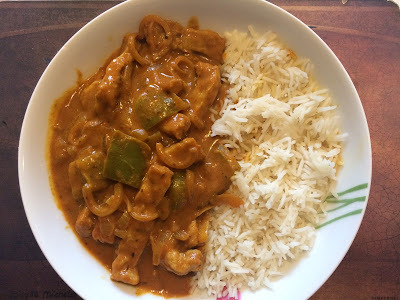 So here’s my attempt at a tikka masala. I am not going to claim this is in any way authentic and I totally cheated, because instead of toasting and grinding my own spices, I bought tikka masala curry paste! Most recipes I found had tinned, chopped tomatoes in and Mr A did look truly horrified when he saw me opening a carton of passata! But the only time I ever remember eating chicken tikka masala in my pregan days, the sauce was smooth – no lumps of tomato. It was also BRIGHT fire engine red, but that’s by the by. So I went with passata so that it would be like the one I remembered. This dish was super freakin easy and really tasty. All I did was fry a chopped onion and a grated thumb size piece of ginger in a bit of coconut oil. Then I added 2 generous tablespoons of tikka masala paste (I used Pataks) and cooked this for a minute or too. Then I added a chopped green pepper, half a cup/125ml of passata (mine had garlic and herbs added) and half a cup/125ml of hot water and a veggie stock cube. Lid on, left it to cook for 15 minutes. Then I added 150g of fry’s chicken style strips and put the lid back on to cook it for 5 more minutes. I like to add these near the end of cooking, as too much cooking in liquid doesn’t do nice things to the texture! Lastly, I stirred through half a cup/125ml of light coconut milk and just cooked it for a couple more minutes to heat through. I served it with plain old basmati rice. I remember seeing a cooking programme years ago where they made it and used an absolute tonne of food colouring! yuck. I'm excited for vegan quorn too! I've never had this dish, but it looks really good. You can't go wrong with Indian or Indian-adapted dishes. Nothing wrong with Patak's curry paste! Your curry looks lush. I would love to eat a massive bowl of that! Smooth sauce trumps chunky sauce any day. And you can't ever go wrong with plain old basmati rice.